Last weekend saw my annual visit to Manchester for the Manchester Coffee Festival. If anyone is confused, this is what was, for the past two years, Cup North. It’s been interesting to watch the evolution of the festival. In its first year, Cup North was my favourite coffee festival, small, friendly and intimate. Last year, it had taken things up a notch, with a new venue, the Victoria Warehouse, and a significant increase in size. This year, it’s gone one better, all while retaining its friendly, relaxed nature, particularly when compared to London Coffee Festival. All the usual suspects were there, with the roasters out in force, backed up by some equipment manufacturers and coffee kit suppliers. There were various food-related stands, including cake, bread and milk. Everything you need, really. Popping outside, there was also a range of street food in case you got too hungry. 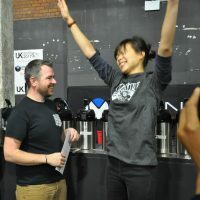 Making a triumphant return from last year was my favourite coffee competition, the UK Cup Tasters’ Championship, while Tamper Tantrum was back with a series of talks. As usual, over the two days, I saw almost everyone I wanted to, but there’s quite never enough time to get around all the stands! For the second year running, the Victoria Warehouse in Stretford welcomed the Manchester Coffee Festival. Right by the Manchester Ship Canal, next door to Old Trafford (football) stadium and around the corner from Media City, it might not be in the heart of Manchester, but it’s not exactly out in the sticks either. The venue itself was, as the name suggests, an old warehouse, built in the 1900s to serve the Manchester Ship Canal and recently converted in events space and a hotel. What I hadn’t realised was just how big Victoria Warehouse is. Last year, Cup North was in the ground floor of the main building to the left, which also houses the hotel. This year, the newly-renamed Manchester Coffee Festival had shifted over to another, larger (but lower) warehouse to the right, which had one immediate advantage: the entrance was far easier to find! I also think that the new space suits the Festival better. Last year Cup North was split over several inter-connected spaces, which made circulation more difficult, particularly since two of the main spaces were at either end of a long corridor. Although the Manchester Coffee Festival was similarly split over multiple spaces, they were much more interconnected, making it far easier to get around between the various stands. Essentially, the Festival occupied four sides of a large square, with the middle taken up by the toilets. Entering in the bottom-right, two rows of stands ran along the bottom of the square to your left, while on the right was a seating area for the sustainability talks (of which I managed to make precisely none…). The left-hand side of the square housed another seating area, which hosted the Tamper Tantrum talks (which I did actually get to for once) and the Cup Tasters’ Championship. Finally, the top side of the square had another dual row of stands, with a further space beyond this, also with a dual row of stands. Although it was probably bigger than last year, it felt much less cramped, with much more space, particularly between the rows of stands. The ceilings were also higher, which all contributed to the sense of space. While there were more people attending this year, the extra space meant it was much less crowded. Finally, it was much easier to move around. Whereas last year there was a tendency to stay in one space, here it was very simple to move around the various spaces. You could do a sweep of all the stands and seating areas in a couple of minutes just by walking in a figure-of-eight. Even those stands tucked away in the corners or at the ends of the rows seemed to be constantly busy. So while that was what the place was like, what did I get up to? Well, after the gallery, you can see what I made of my favourite coffee competition, the Cup Tasters Championship. As I’ve said before, I’m not a huge fan of watching coffee competitions, but the one exception to this is the Cup Tasters Championship. The set-up is simple: faced with three bowls of coffee, the competitors have to select the odd one out. Get it right, get a point. What I like about it is that there’s nothing subjective or interpretive about it. Three competitors at a time go head-to-head, each faced with eight groups of bowls. Working their way along the bowls, once a competitor has chosen the odd one out, the bowl is placed beyond a blue line (and, once moved across the line, can’t be changed). Accuracy is all important, with the aim to get a perfect score, but speed also plays a role; if anyone is tied, then the winner is the one who takes the least time. There were 36 competitors in all (up from 24 last year), who went off in 12 heats of three. Last year, the top nine went straight through the semi-finals, but this year, with so many competitors, there was a second round, where the top 21 competitors were further whittled down to the nine semi-finalists, before the top three went through to the final. As in previous years, it’s not the winners of the individual heats who go through, but those with the overall best scores in that round (the scores from previous rounds don’t count). I really enjoy watching the individual rounds and there was genuine tension, especially at the scoring stage, when each bowl was checked to see if it was right or wrong, with the crowd cheering their favourites on. I had some personal interest as several of my friends were competing, including Katelyn (ex Avenue Coffee, now with Volcano Coffee Works/Assembly) who finished second last year, Holly (North Star), Diana (Taylor Street Baristas) and Catherine (ex Artisan Roast, now Clifton Coffee Roasters). Also back for another year were last year’s winner Gayan Munaweera (UCC Coffee) and Sonali Tailor (Has Bean), who finished third. With so many competitors, the competition was spilt over the two days of the Festival, with the first round taking place on the Saturday and round 2, the semi-finals and finals taking place on the Sunday. Just to give you an idea of how stiff the competition was this year, last year’s winner, Gayan, didn’t make it out of the first round. To get through, you had to score at least six out of eight and, out of 36 competitors, only Holly and Sonali managed perfect eights. However, the previous round’s scores count for nothing and in another illustration of how tough things were, both Holly and Sonali fell by the wayside in the second round. Katelyn, however, came to the front with a perfect eight, joined by Paul and Agnieszka, all three of whom had only scored 6/8 in the first round. The other semi-finalists were Ed, Freda, Nicole, Josh, Jesse and Will, all of whom scored 7/8. An honourable mention has to go to Tom, who also got 7/8, but wasn’t quite quick enough. The competition was just as fierce in the semi-finals, although my note-taking let me down, so I don’t have the semi-final scores. However, the three finalists were Nicole Ferris of Climpson and Sons, Will Sumner of Steampunk Coffee and Freda Yuan from Caravan. In a very tight final, Will came fourth with a score of 4/8, albeit in an impressively quick 2 minutes 23 seconds, while Nicole was second with 5/8. However, out front was a delighted Freda, the clear winner with a score of 7/8 in just 3:55. Congratulations to Freda and all the other competitors, who made it such a compelling event. Also thanks to Mat North, Rob Ward and Dave Jameson for organisation/commentary, plus sponsors Bunn and Campus at Union who roasted all the competition coffee. Check out Part II of my Manchester Coffee Festival round-up. Meanwhile, you can see how Freda got on when she defended her title in the Cup Tasters Championship at the 2017 Manchester Coffee Festival. Don’t just take my word for it. You can see what fellow coffee-bloggers, Bean There At and Commodities Connoisseur, made of the Manchester Coffee Festival. Thanks so much for sharing all about the manchester coffee festival, it sounds like it was a really fun event, it is nice to see it growing and improving from previous years but still staying true to its original laid-back atmosphere and general ethos! The competition sounded like a lot of fun, a great way to get the community involved in some friendly competition, a lot of familiar names in the list, sounds like it was tricky but a great time!